S -13° 38' 13" and W -172° 11' 39"
Sa’asa’ai in Fa‘asaleleaga with it's 520 citizens is a town in Samoa about 32 mi (or 51 km) north-west of Apia, the country's capital city. Current time in Sa’asa’ai is now 08:42 PM (Sunday). The local timezone is named Pacific / Apia with an UTC offset of 13 hours. We know of 7 airports near Sa’asa’ai. 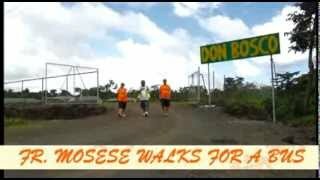 The closest airport in Samoa is Maota Airport in a distance of 8 mi (or 14 km), South-West. Besides the airports, there are other travel options available (check left side). When in this area, you might want to pay a visit to some of the following locations: Safotulafai, Vailoa, Satupa`itea, Mulifanua and Safotu. To further explore this place, just scroll down and browse the available info. Let's start with some photos from the area. 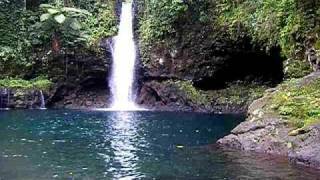 Afu A'au Falls is the best waterfall in Savaii (Samoa). 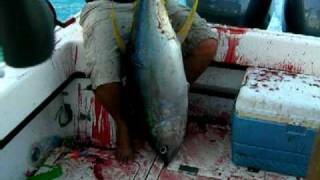 Samoa Savaii Siufaga Big Tuna catch Niko. The independent country of Samoa consists of the two large islands of Upolu and Savai'i and 8 smaller islands located about halfway between Hawaii and New Zealand in the Polynesian region of the South Pacific. The island of Upolu is home to nearly three-quarters of Samoa's population and its capital city of Apia. The climate is tropical, with a rainy season from November to April. To the East is the smaller American Samoa, see also Geography of American Samoa. Located at -13.5833, -172.333 (Lat. / Lng. ), about 10 miles away. Salelologa is a village district at the east end of Savai'i island in Samoa. It is the main entry point into the island with the only ferry terminal on Savai'i. It also serves as the main township for shopping and public amenities with a market selling fresh produce and arts and crafts. Salelologa is made up of smaller sub-villages pito nu'u and falls within the electoral district of Fa'asaleleaga. Located at -13.7333, -172.167 (Lat. / Lng. ), about 7 miles away. The Pulemelei mound (also known as Tia Seu Ancient Mound) is the largest and most ancient structure in Polynesia. It is situated in Letolo Plantation in the Palauli district, at the east end of Savai'i island in Samoa. The stone mound is a pyramid constructed of natural basalt stones and at its base measures 65 by 60 metres ( ft × ft) and has a height of about 12 metres . Located at -13.735, -172.324 (Lat. / Lng. ), about 11 miles away. Gaga'emauga is an electoral district on the island of Savai'i in Samoa. The district is situated on the central north side of Savai'i. The name Gaga'emauga literally means: “near side of the mountain” meaning the eastern side of the mountain chain running through the centre of Savai'i. The traditional centre of the district is Saleaula, where the district chiefs and orators meet at Vaitu’utu’u malae. Located at -13.5, -172.25 (Lat. / Lng. ), about 10 miles away. Fa'asaleleaga is a district of Samoa situated on the eastern side of Savai'i island. It has a population of 12,949 (2001 Census). The traditional capital is Safotulafai where district chiefs and orators meet at Fuifatu malae. Safotulafai was the main base of the 'Mau a Pule' resistance movement against colonial rule, which grew into the national Mau movement and eventually Samoa's political independence in 1962. Located at -13.6667, -172.25 (Lat. / Lng. ), about 4 miles away. Tafua is a seaside village on the island of Savai'i in Samoa. It is situated on a peninsula on the southeast coast of the island in Palauli district. The population is 408 (2006 Census). Located at -13.7833, -172.217 (Lat. / Lng. ), about 10 miles away. Sala'ilua is a village on the island of Savai'i in Samoa. It is situated on the south coast of the island in Palauli district. The population is 684 (2006 Census). Lalomalava is a village at the southeast end of Savai'i island in Samoa. The village is part of the electoral constituency (Faipule District) Fa'asaleleaga I which is within the larger political district (Itumalo) of Fa'asaleleaga. The population is 415 (2006 Census). There are also other villages called Lalomalava on the island of Savaii. Located at -13.7, -172.133 (Lat. / Lng. ), about 6 miles away. Maota Airport is the main domestic airport on the island of Savai'i in Samoa. It is situated near Salelologa at the east end of Savai'i. The airport is located 10 minutes south of Salelologa township and ferry terminal. The airport has been in operation since the early 1990s. It services flights from Faleolo International Airport on the main island Upolu and Asau Airport at the northwest end of Savai'i. Located at -13.7422, -172.258 (Lat. / Lng. ), about 8 miles away. Patamea is a village on the island of Savai'i in Samoa. While most villages on Savai'i are situated near the sea, Patamea is situated inland, away from the coast. The village is in the Gaga'emauga political district near the central north coast of the island. Heading north west on the main road from Salelologa township and ferry terminal, the turnoff to Patamea is just before Samalae'ulu village at a T-junction of the road. Located at -13.4833, -172.267 (Lat. / Lng. ), about 12 miles away. Safotulafai is a traditional sub-district at the east end of Savai'i island with historical and political significance in Samoa's history. It is the traditional centre of Fa'asaleleaga political district. Safotulafai is the original 'Pule', which is why Savaii is called 'Pule' of Samoa. Years later, Safotulafai chose to divide the 'Pule' into six while reserving the right to be the 'Matua' of 'Pule'. Located at -13.6667, -172.117 (Lat. / Lng. ), about 6 miles away. Vaito'omuli is a village on the island of Savai'i in Samoa. It is situated on the south east coast of the island in Palauli district. Located at -13.75, -172.3 (Lat. / Lng. ), about 11 miles away. Puleia is a village on the island of Savai'i in Samoa. It is situated on the south coast of the island in Palauli district. The population is 256 (2006 Census). Located at -13.75, -172.35 (Lat. / Lng. ), about 13 miles away. Satufia is a village on the island of Savai'i in Samoa. It is situated on the south coast of the island in the political district of Satupa'itea. The population is 503 (2006 Census). Located at -13.7667, -172.3 (Lat. / Lng. ), about 11 miles away. Vaega is a village on the island of Savai'i in Samoa. It is situated on the south coast of the island in the political district of Satupa'itea. The population is 538 (2006 Census). Located at -13.7667, -172.333 (Lat. / Lng. ), about 13 miles away. Siutu is a village on the island of Savai'i in Samoa. It is situated on the southeast coast of the island in Palauli district. The population is 683 (2006 Census). Archaeology in Samoa uncovered pre-historic samples at a midden site in the village. Sa'asa'ai is a village at the east end of Savai'i island in Samoa. The village is part of the electoral constituency (Faipule District) Fa'asaleleaga III which is within the larger political district (Itumalo) of Fa'asaleleaga. The population is 626 (2006 Census). Located at -13.6333, -172.2 (Lat. / Lng. ), about 0 miles away. These are some bigger and more relevant cities in the wider vivinity of Sa’asa’ai.